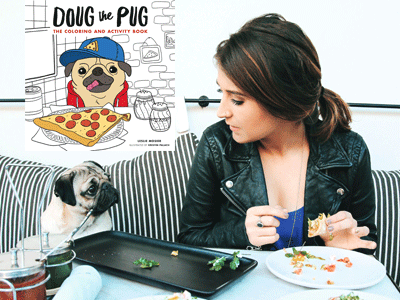 New York Times-bestseller, Shorty Award-winner, and pizza lover extraordinaire Doug the Pug is joining us at Books Inc. in Opera Plaza for a special meetup in celebration of his delightful new book, Doug the Pug: The Coloring and Activity Book! Get in on the fun with the "King of Pop Culture" Doug the Pug as he eats his way around the world in this delightful coloring book, packed with dozens of illustrations and fun activities. Whether he's cozying up on the couch with take out and television, hanging out with celebrities on the red carpet, or attending the latest music festival, Doug the Pug has stolen hearts around the world. In this adorable coloring book, join Doug on his adventures sampling a wide range of wonderful flavors from country to country and coast to coast. Along with 75 illustrations that capture the planet's most famous pug with his local snack of choice, this charming coloring book includes entertaining themed interactive activities. As adorable as its namesake, Doug the Pug is a must-have for the king's fans, dog lovers, and coloring enthusiasts of all ages. A Books Inc. receipt for Doug the Pug: The Coloring and Activity Book is required for a place in the signing line. Doug will pose for one photo per group. Please have your cameras ready before you reach the signing table. 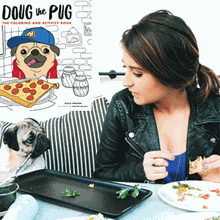 Doug will also pawtograph copies of his previous title, Doug the Pug: The King of Pop Culture.